Beginning fall 2017, Middle Georgia State University will consolidate all vocal and instrumental music program instruction on the Macon Campus while continuing to perform at events across the institution. 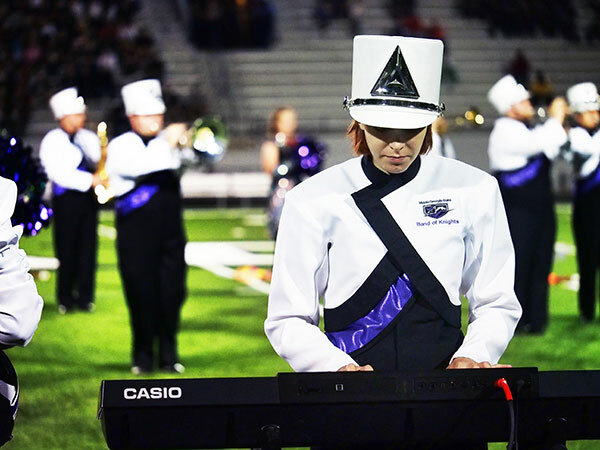 MGA's vocal and instrumental music programs include the Band of Knights marching band, color guard, drumline, concert band, jazz ensemble, classical guitar ensemble, percussion ensemble, and chamber singers. Among the performances that will regularly take place throughout the University, the marching band will continue to perform at halftime shows for the MGA club football team's home games on the Cochran Campus. Because the majority of MGA students who want to participate in music programs take classes on the Macon and Warner Robins campuses, consolidating instruction at a single, more convenient location will give them those opportunities. 9 a.m. and 2 p.m. Monday, Feb. 27, Arts Complex Theater, Macon Campus. 9 a.m. and 2 p.m. Tuesday, Feb. 28, Arts Complex Theater, Macon Campus. A Macon Campus map is at https://www.mga.edu/about/campuses/docs/macon-map.pdf. Questions can be emailed to music faculty members Dr. Alan Clark at norman.clark@mga.edu, Dr. Rebecca Lanning at rebecca.lanning@mga.edu, Tisha Simeral at tisha.simeral@mga.edu or Miguel Castro miguel.castro@mga.edu.